We can't believe you're still using a remote. You should be ashamed when tech like MindRDR TV exists. 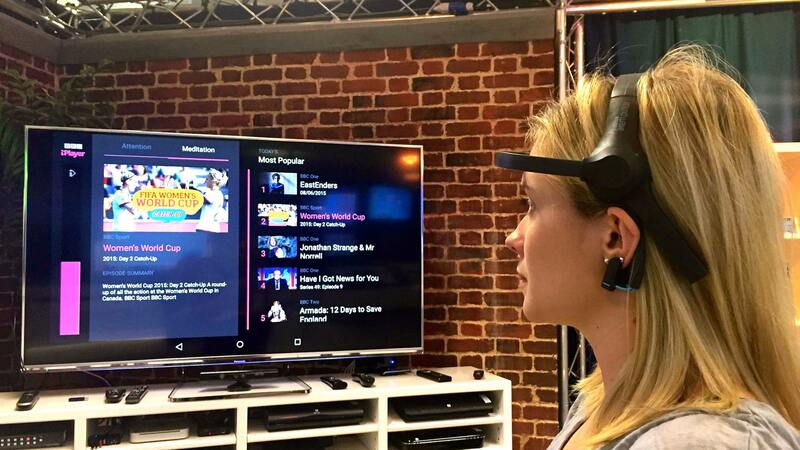 It's the brainchild - yes - of Shoreditch-based user experience company This Place, and uses a Neurosky EEG headset to read the wearer's brain activity to translate into smart TV controls for YouTube and BBC iPlayer apps via a Google Chromecast. This is how it works - essentially you select a TV programme simply by thinking about it. MindRDR TV cycles through options onscreen, such as popular YouTube videos, every ten seconds until the user 'selects' a video to watch using their brainwaves. Users can even choose between 'meditation' and 'attention' states as controls. Seriously, this is not a drill - if the name sounds familiar, you might have read about This Place's mind controlled interface for wearables such as Google Glass back in 2014. The Android version of MindRDR TV is being prepared for a limited release on Google Play to get more focus group-style research on the interface. The iPlayer integration was commissioned by the BBC and is internal only for now. It works with an experimental version of iPlayer, uses the same low cost Neurosky headset and has been tested as a proof-of-concept on BBC staff in its technology Blue Room. Watch the video on BBC's blog. Cyrus Saihan, head of business development for BBC Digital explained that mind control was chosen for this experiment into new audience experiences partly because movies like Star Wars and the Matrix have fascinated us for decades. "Whether it's using 'the Force' in Star Wars, spoon bending on stage or The Matrix," he said, "controlling objects simply with your brain has a unique appeal and could open up a whole world of possibilities." We've already seen voice control for BBC iPlayer on Xbox One but Saihan wants viewers to get access to shows even quicker - by thinking 'put BBC One on' at home or 'I want to listen to Radio 4' in the car. But the system also had the potential to help people with disabilities access the Beeb. Companies like Philips have already been experimenting with brain activity-controlled smart light bulbs. And the BBC is interested in brain-computer interfaces for people with, for instance, motor-neurone disease or locked-in syndrome who may be able to use services like iPlayer with an EEG headset. This Place says MindRDR is first and foremost a response to "clunky interfaces". In a blog post, Dusan Hamlin, founder and CEO, said: "We've always been interested in the challenge of 'smart' TV interfaces. So we decided to focus on dramatically improving the user experience by removing barriers between users and the content they want to watch. In fact, we removed every single barrier so people can directly control TVs with their mind."